Hope you’re ready to enjoy World Watercolor Month! I’m celebrating with a little postcard playtime. These Canson cards can be painted quickly with a sketch while you’re on vacation – and sent off in the mail right away! If you’re just a bit taken aback by yet another group of supplies to buy to try out some painting – let me show you an easy way to try it out. All you need is a Dot Card, a pack of Postcards or Blank Cards, 5 X 7 (with envelopes) and a brush, Short Round 12 or Short Round 8 . Easy peasy! Watch the video below or click HERE to see it in HD on YouTube. I’ll be posting more postcards and greeting cards on Instagram – keep your eyes peeled! Sometime today I’ll be doing another Facebook Live – this time on the ArtClasses page so go turn on notifications! (Yesterday’s was on my Sandy Allnock LLC page HERE.) I’m going to see if I can do a quick sketch live each day all month long, alternating accounts….let’s see how that plan goes! You make it look so easy! Love the scene, may even try that myself. Beautiful painting. It inspires me to paint without a stamped image–I’ve been lazy about doing that lately. I love the scene and the transparency of the boats, it just looks right to me. I too use watercolor postcards to send to my grandmother regularly, but I might like the canson ones better, they’re a little bit bigger than the ones I have now. Thanks for sharing this and so many other techniques and knowledge! Your videos inspire me a lot! I love this. So simple but so beautiful! Beautiful! The scene is so relaxing. Question: After the watercolor dries, do you add anything over it to protect it in the mail? Nope 🙂 It was just a quick sketch, nothing major. I love watching your Magic Paintbrush! Thanks for this great video, Sandy. I haven’t done any extended watercoloring for ages (only bits of color added to stamped images). 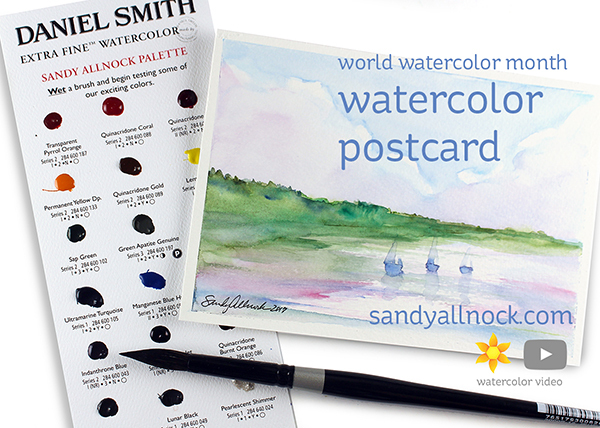 Your postcard scene is a real invitation to try something during this watercolor month. Oh my sandy I really love this! What a wonderful personalized idea – a portable “to-go” kit, and a hand painted postcard to send while traveling.